It was a wet winter and an even wetter spring across most of Victoria this year. With these high levels of moisture its hardly surprising that fuel levels across the state are now high. And as the state moves into summer, Emergency Management Victoria which is the government body established to operate and manage any emergency in the state. 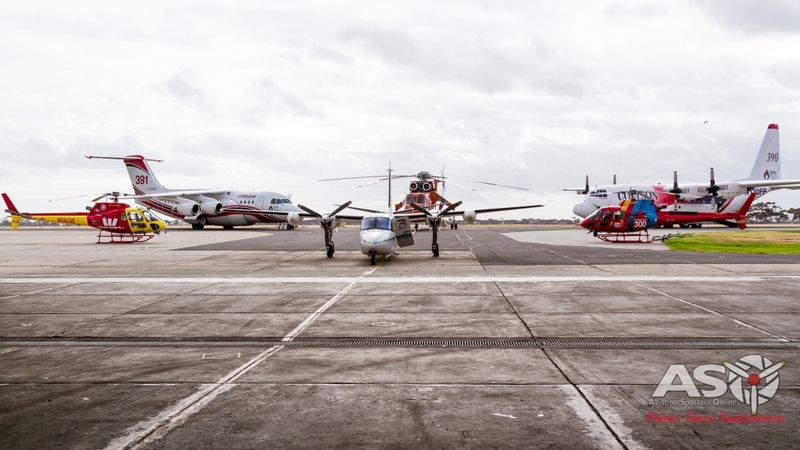 EMV presented to the media its fleet of aerial assets today which includes everything from drones to the Large Aerial Tankers or LATS. 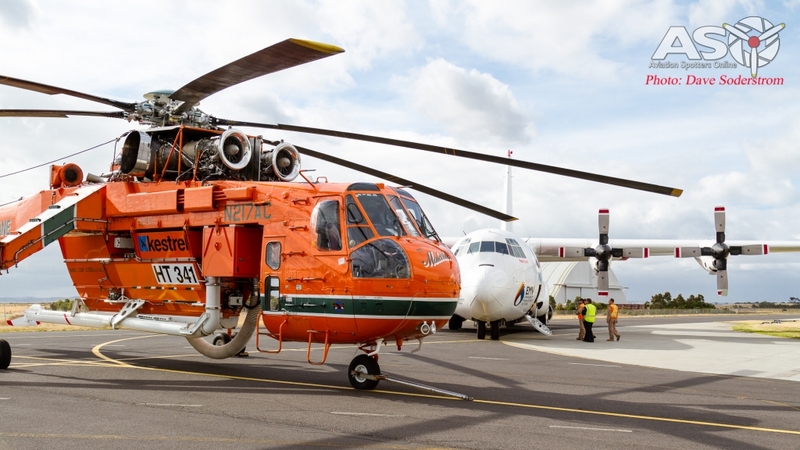 These assets are part National Aerial Firefighting Centre (NAFC) which is also part of the larger Australian Government operation which brings together all the states and territories, established to operate the various types of aerial firefighting assets. 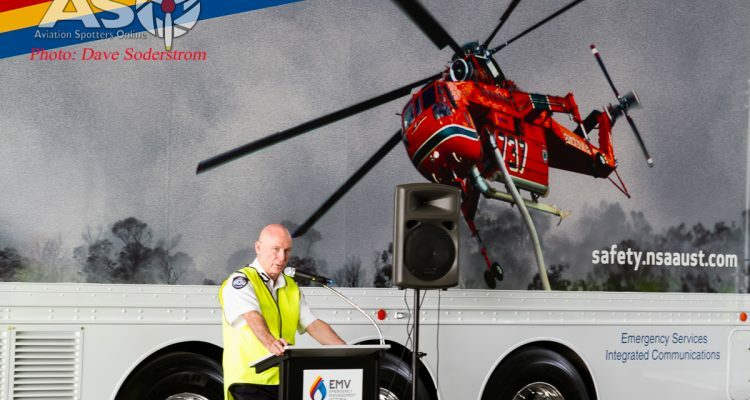 The days proceedings were initiated by the Emergency Management Commissioner of Victoria, Craig Lapsley, who along with Emergency Services Minister James Merlino, Forest Fire Management Victoria Chief, Stephanie Rotarangi, MFB Acting Chief Officer, Paul Stacchino, CFA Deputy Chief Officer and Bruce Byatt, were all present to introduce the stand up of the fleet in Victoria as of the 14th December 2016. 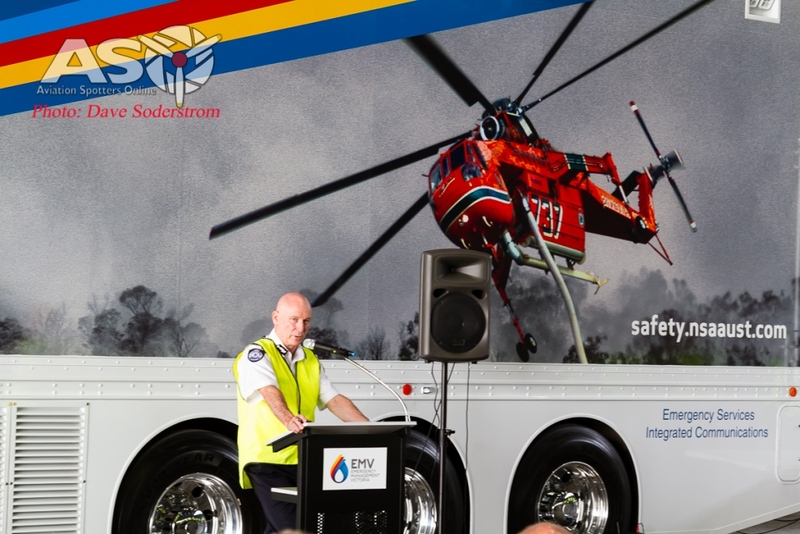 Emergency Management Commissioner of Victoria, Craig Lapsley addresses the media. Forest Fire Management Victoria Chief, Stephanie Rotarangi, explains the roles within EMV. A small representation of some the fleet were proudly on display and their capabilities were exhibited by their various operators. This season some 48 assets are on contract up from the 40 from the previous season. Commissioner Lapsley highlighted the continued investment by the Government in the aerial assets and also explained the trial of night vision aided bombing this season. 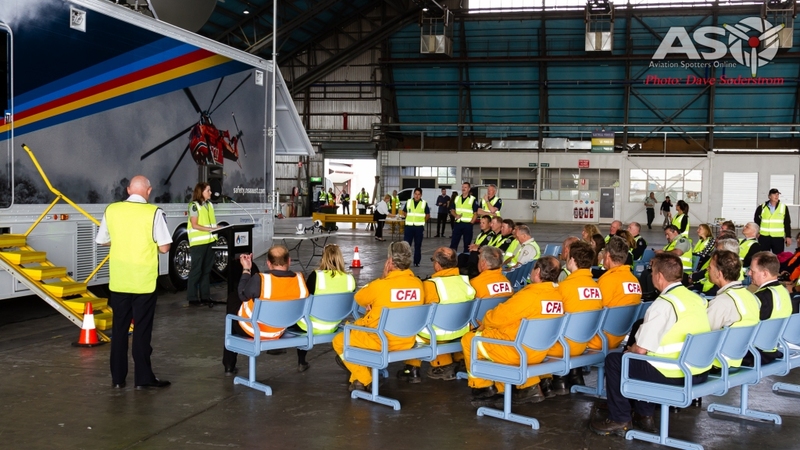 Emergency Services Minister James Merlino, inspected the various aircraft and helicopters today reaffirming the governments commitment to these vitally important assets in conjunction with ground based fire fighting equipment. 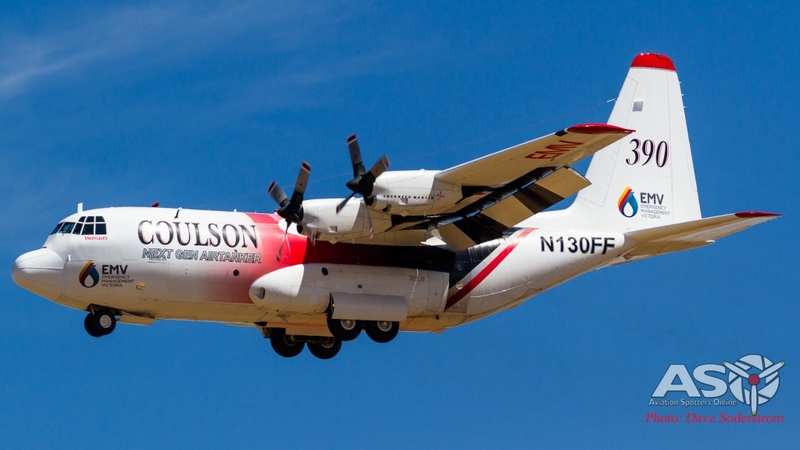 Above is Coulson Aviation’s Lockheed C-130Q Hercules N130FF or ‘Bomber 390’. This aircraft started life with the United States Navy (USN) as a EC-130Q being used in the Take Charge And Move Out or TACAMO role where its core role was as a communications relay in the event of a crisis. 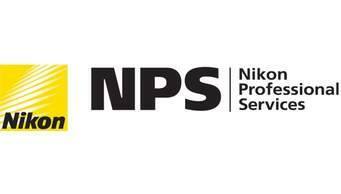 After its service with the Navy it was then transferred to NASA being used by the American Space agency until around 2004. 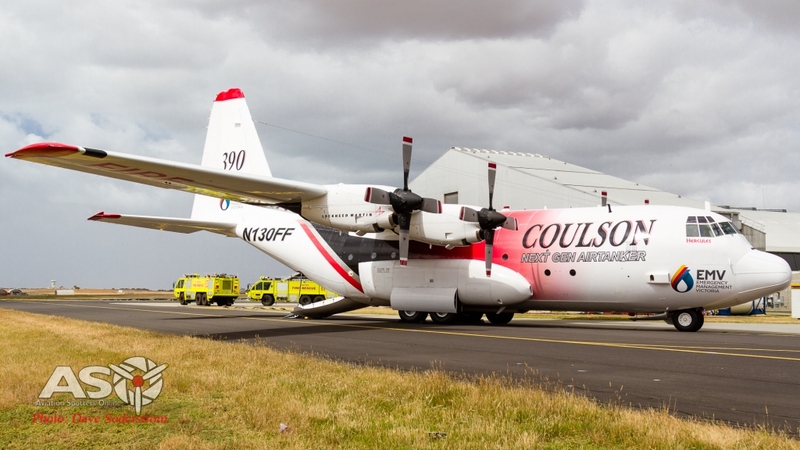 It was then purchased by Coulson and became part of their Next Generation Airtanker project. 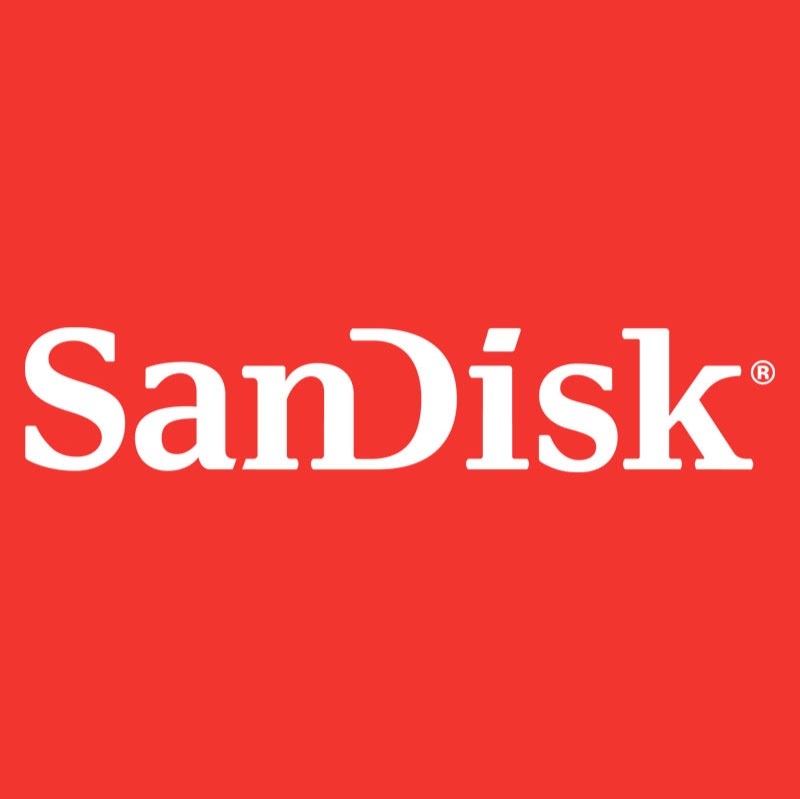 The aircraft is linked via a secure datalink to its home base which tracks the aircraft’s performance and drop statistics. The aircraft arrived into Avalon on December 12 where the aircraft and crew cleared customs and began preparations to start the contract. 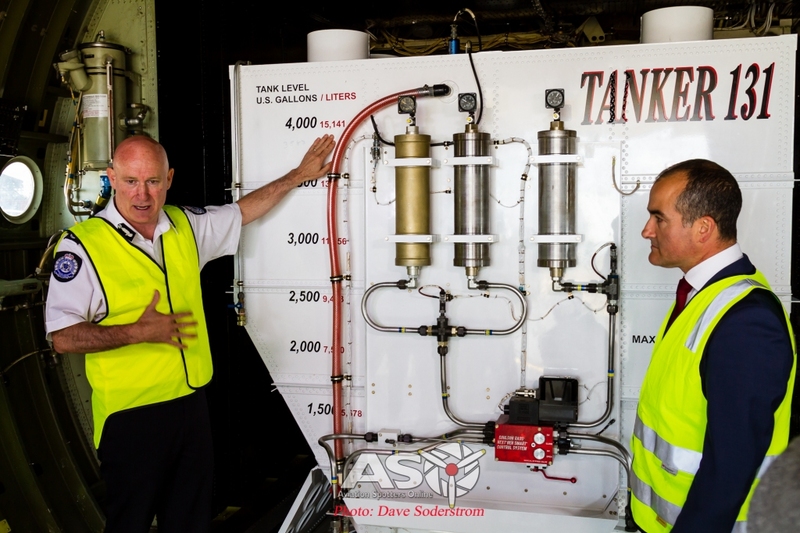 Emergency Management Commissioner, Craig Lapsley highlights the C-130Q’s tank capacity of 15,141 Litres to Emergency Services Minister James Merlino. Conair’s/ FieldAir’s British Aerospace Avro RJ85 C-GVFK or ‘Bomber 391’ This particular air frame was originally delivered to Lufthansa Cityline in 1995. Built at British Aerospace’s Woodford production facility the now 21 year old air frame certainly doesn’t look it. 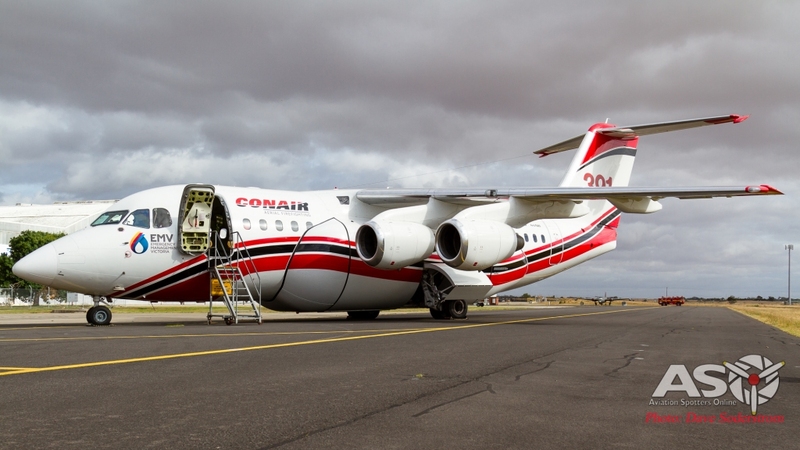 The RJ85 proved its worth in the 2015/16 fire season with its quick turn around and deployments in not only Victoria but in Tasmania and South Australia as well. 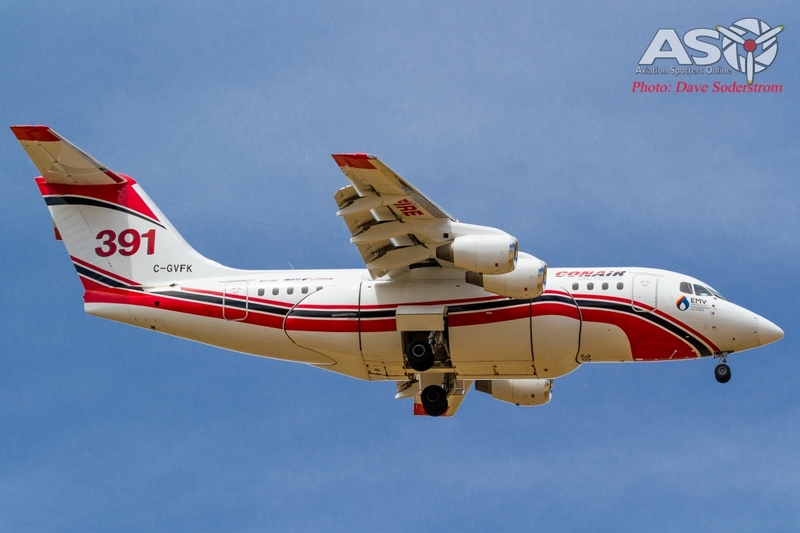 Converted with a bolt on water tank and drop design so as not to compromise the aircraft structure the RJ85 is back for its third fire season. The 11,305 litre retardant tank capacity and combined with the four jet engines makes this aircraft well suited to slower speed water drops and the reliability and power from them. One of several RJ’s in the Conair fleet this aircraft has been found to be a very well suited air frame to firebombing, with the eighth air frame now under conversion. The RJ85 arrived in Avalon on December 5. Also returning to operate along side the LATs is the vitally important Birddogs. 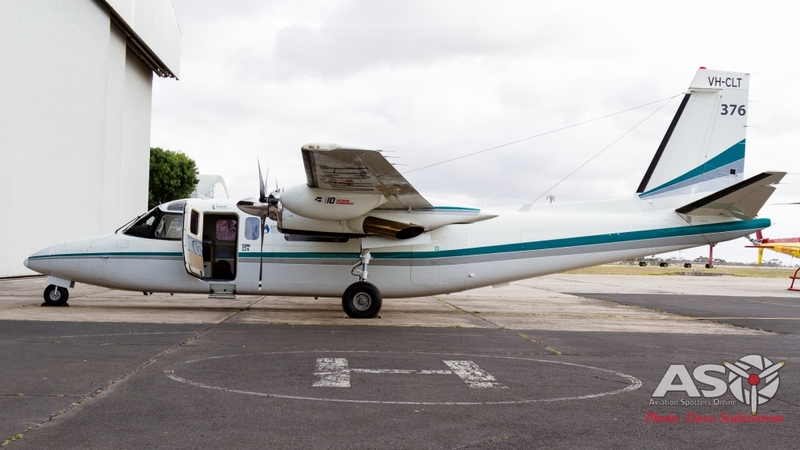 These aircraft which includes Aero Commander 690 VH-CLT or Birddog 376, which is operated by Tasmaian Seafoods, are tasked with the assessment of the fire and provide a lead in for the LATs and VLAT’s. The return of the King? Not quite. 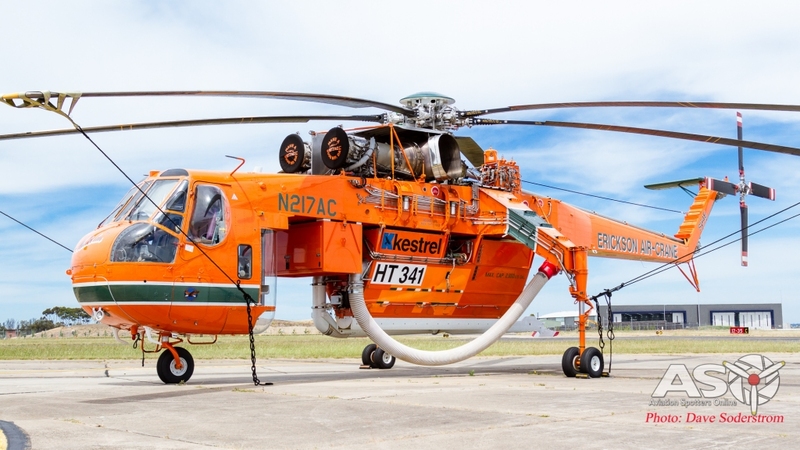 Kestrel Helicopters in conjunction with Erickson Air-Crane are back and have provided two of their S-64E Air Cranes this season. N217AC Helitak 341 and N957AC Helitak 342. In a change from last season one of the cranes will be based at Moorabbin airport instead of Ballarat in the states North. This has been replaced by a smaller Bell 412 which which is better suited to operations in that area. Another type on display was the Squirrel helicopter exhibited in two forms by Microflight with VH-XXW and VH-LSR. Both preform very different functions. 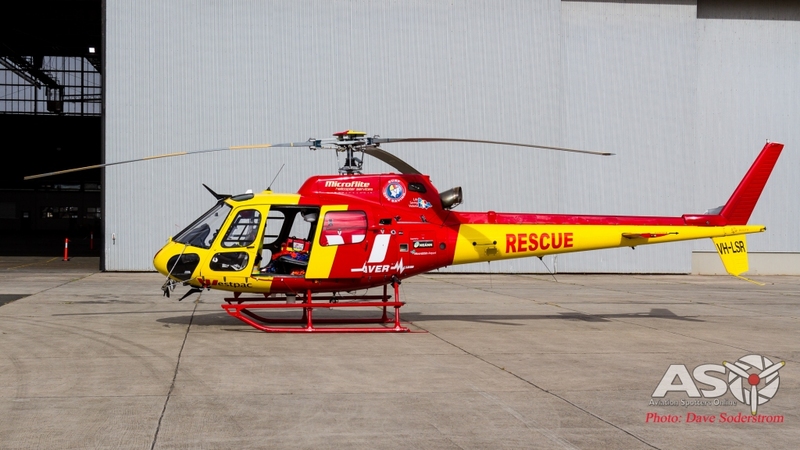 VH-LSR, an AS350B2 model is part of the Westpac Life saver RESCUE fleet. 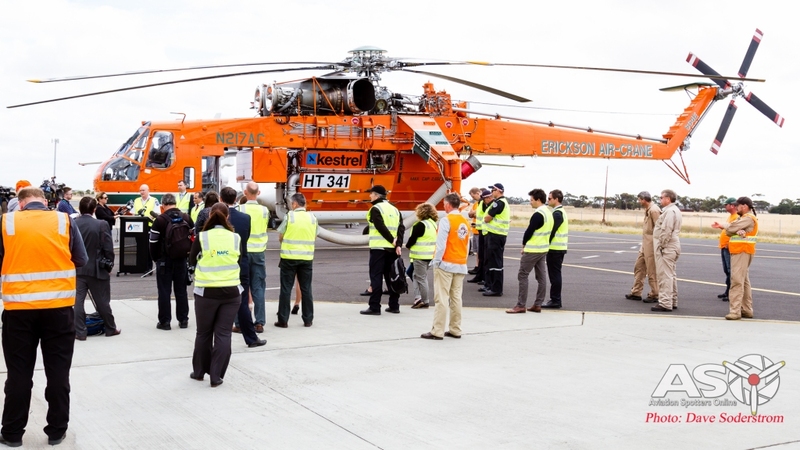 Normally based in Barwon Heads on Victoria’s surf coast this helicopter will be tasked for Search and Rescue when it is needed in the event of an emergency. VH-XXW also a Squirrel type an AS350B3 is fitted out with an in-house developed sophisticated surveillance system Microflite developed this from the ground up with a Wescam MX-10 camera. A single crew member in the rear cabin has three camera sensors which enables the crew to monitor the fires in both infra-red and in high definition which is sent in real time to the Emergency Management Victoria (EMV) control room when the machine is overhead an active fire which is vital for making accurate decisions in real time thus enabling the fire to be managed more effectively. Of course this is but a small snap shot of the types and their roles preformed this season. ASO will bring you a full coverage of the whole fleet at seasons end. ASO wishes to thank our hosts for the event today and their hospitality.